Company projects on-the-go sales will bring in $1.5 billion this year. This week has been a busy one for eBay as the company unveiled two mobile apps and a revamped classified ads site, even as it rolled out major price and listing-format changes within the eBay Marketplace. The new apps, eBay Selling and eBay Classifieds, give sellers a way to list items quickly, while on the go. The new classified ads site, eBay Classifieds, will replace eBay's U.S. Kijiji site, which lagged behind Craigslist in popularity. In February, Craigslist reported 4.5 million visitors compared to Kijiji's 2 million. eBay hopes the rebranding and redesign of the free classified ads site will foster trust among users with its familiar name and a strong filtering system meant to reduce spam and fraud. "eBay Classifieds sets a new standard in the U.S. classified market, offering a trusted, local-community selling format for items that don't make sense to sell on eBay marketplace, or when selling locally is preferable," notes Lorrie Norrington, president of eBay Marketplaces. eBay will keep the Kijiji name on its non-U.S. classified ads sites, which are attracting more traffic. 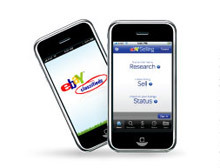 The new eBay Classifieds mobile app could help the classifieds site draw more users. It allows sellers to post ads in 60 seconds, search and reply to classified ads, add up to eight images, and narrow searches by keywords, location and price, eBay reports. "Whether selling or shopping, we've introduced a great new option for consumers who prefer to sell and buy in a trusted, family friendly local classified format," Norrington says. With the eBay Selling app, merchants can photograph and post listings in 60 seconds, research similar items, view the products they have for sale, and share listings on Facebook and Twitter. The addition of these mobile apps will help eBay generate an estimated $1.5 billion in 2010 through mobile apps, eBay says, adding that more than 8 million people shop on eBay using mobile devices. Norrington says eBay offers buyers and sellers more choices for e-commerce than any other company. "The eBay Selling app makes it easy for sellers to bring even greater value and selection to eBay and offer more great deals for buyers," she adds. Company plans to acquire online ad sites. Holiday buyers purchase 1.5 million items on the go. Ask Auctiva: Will Auctiva Have Mobile Apps? Tom Urbanowicz answers this and other questions from Auctiva customers. Site drives into local markets to target savvy buyers. Revenue and profits rise, while new initiatives show promise. Auctiva team investigates seller applications for the iPad. Garden by eBay lets members test drive three very different home page concepts. Company hopes to spur innovation in e-commerce and mobile apps. Apps expected to bring in $1.5 billion to $2 billion in sales this year. eBay Classifieds makes importing completed listings easy, eBay says. Bargain-hunting app gives buyers more options, sellers pricing trends. Site adds Blackberry app to its arsenal, becomes top mobile retailer. Rapid growth coincides with gains in mobile and Latin American e-commerce. Both Internet powerhouses claim victory in bitter 'poison pill' dispute. Milo.com will add a local-shopping element to the online marketplace. Survey says it's bigger than sliced bread.